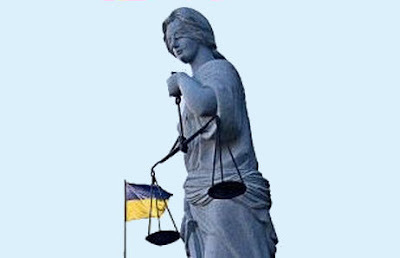 KIEV, Ukraine -- Ukraine’s judicial system and rule of law have not emerged from the Viktor Yushchenko era in very good shape, with Ukrainian lawyers and international monitoring organizations noting a sharp rise in corruption among judges and prosecutors in the last five years. The Lady of Justice stands by the entrance of the Kyiv Administrative Court of Appeals. The prosecutor general’s office has become a graveyard for criminal cases, a redundant institution where criminal cases go to linger, stagnate and then be buried and forgotten. Surveys of Ukrainian lawyers have found they feel that instances of political interference in their work have increased exponentially during the last five years, probably as an outcome of political instability, crises and in-fighting among the elite. As political elites jostled one another for power, they pressured judges and prosecutors to produce favorable outcomes. We all remember political interference by both sides in the Constitutional Court in the spring 2007 political crisis, after Yushchenko disbanded parliament. A clear instance of political interference is this week's decision by the Constitutional Court to overturn its 2008 ruling on parliamentary factions by giving the go-ahead for coalitions to be formed by factions and individual parliamentary deputies. The notorious political decision is reminiscent of the court's 2003 ruling that ex-President Leonid Kuchma could be a candidate in the 2004 elections as he was serving his “first” term. This week's ruling will discredit the Constitutional Court further and drive a nail into its coffin. The decision will be seen as blatantly political both in Ukraine and in Europe and Washington, ahead of President Viktor Yanukovych’s April 12 visit. The ruling could well turn out to put Ukraine on a slippery slope towards authoritarianism and, therefore, political instability. In addition, there has been very little accomplished in the important field of protecting foreign investors, despite rhetoric by all political leaders about making Ukraine friendly for overseas investment. In the last two years the World Bank has ranked Georgia three times better than Ukraine in protecting foreign investors. In terms of ease in doing business and starting up a business, the World Bank ranks Georgia 7-10 times better than Ukraine. What went wrong in Ukraine? And why the dissimilarity with Georgia following each of the democratic revolutions, which took place within one year of each other in 2003-2004. The answer is that Georgia elected a leader who has political will and who operates in a system where his policies can be enforced. Nevertheless, Ukraine is not all doom and gloom and, as ex-President Leonid Kuchma once famously wrote. Ukraine is not Russia – at least for now. Ukraine’s judicial system is down but not yet out. In 2009, Steven Chepa, Norstone Financial Corporation’s president and chief executive officer, lost a $12 million investment in a corporate raid on his wood processing factory, Starwood Zakarpattia. For more than a year, Norstone has fought the attempted takeover through Ukraine’s court system. Results have been positive. Well, mostly. As Americans and Canadians would say, “You can’t make this stuff up:” a low-level state official in Vinnytsia has set himself above the courts of Kyiv and Trans-Carpathia. Disregard for the law has reached astounding proportions. Two court rulings – issued by the Kiev Administrative Court of Appeal’s Judge Saprykina on Jan. 6 and March 3 – made it necessary for the government registrar to register ownership of Starwood Zakarpattia with Norstone. In 2009, the corporate raiders were able to exert sufficient influence to have Starwood Zakarpattia registered as their property in the hope of asset stripping the factory and thus appropriating Norstone’s multi-million dollar investment. A third court ruling – this by the Trans-Carpathian administrative court and dated March 17 – also supports Norstone’s case that it was the victim of an illegal corporate raid and calls for the re-registration of Starwood Zakarpattia where it rightfully belongs. Three court rulings should be sufficient to enforce the matter; or so Norstone thought. It would seem that under the Ukrainian system the same office that knowingly registered Starwood Zakarpattia illegally with the corporate raiders is now required to re-register Starwood Zakarpattia with its rightful owners. This is like asking the fox who stole the chicken to give it back. Is it merely coincidence that the registry office is Vinnytsia, home turf for the corporate raiders? The registry’s bureaucrats have refused to abide by three court rulings, placing themselves above the rule of law. This is legal anarchy! Bureaucrats have no basis on which to refuse to abide by iron-clad court rulings – especially when they come in threes. It is simply unimaginable that a notary in a European or North American democracy could refuse to abide by a court ruling. The consequences would be a fine, immediate dismissal, or even jail. The actions of the Vinnytsia notary make a mockery of Ukraine’s judicial system. Indeed, what is the point of court rulings if they cannot be enforced? The Vinnytsia notary is effectively blocking the re-opening of the Starwood Zakarpattia factory, depriving an economically depressed region (Trans-Carpathia) that is part of a country (Ukraine) that, alongside Latvia and Hungary, experienced some of the worst effects of the global financial crisis. When up and running, Starwood Zakarpattia will employ 100 Trans-Carpathians: one small but significant step in helping Ukraine emerge from its severe economic downturn. Chepa expressed his shock at the actions of the notary in undermining Ukrainian justice in a letter sent to Mykhailo Brodsky, the new head of the State Committee on Regulatory Politics and Enterprises. Andriy Portnov, newly appointed deputy head of the presidential administration with responsibility for legal reforms, should also be made aware of the legal quagmire that Ukraine’s legal system has sunk into. Foreign investment and capital are crucial for the modernization of Ukraine’s economy and vital for economically depressed regions such as Transcarpathia. That is why preventing corporate raiding of foreign investors should be a priority for Brodsky and Portnov.